To all of those people that say, ‘Julie, I need to take you home’… well now you can! Guess what? It has arrived! What do you do when you need a re charge and another emotional work out, and what if there isn’t another show coming to town? Well, here is what you can do. 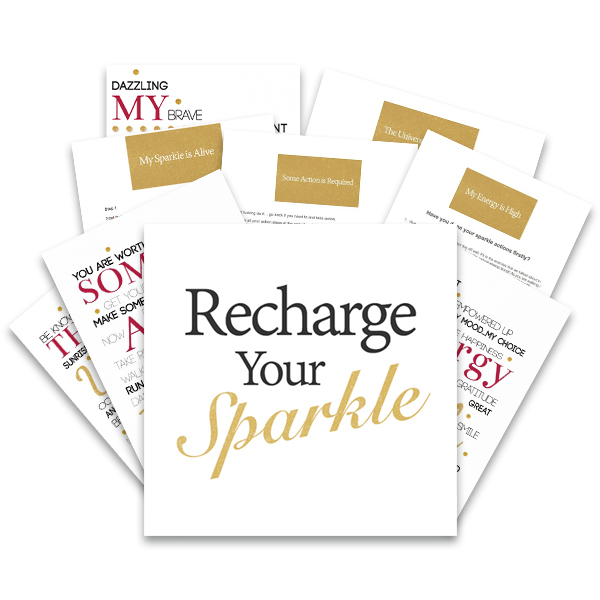 You can make the choice to purchase Recharge Your Sparkle online program… it has it ALL here. Each line of the chorus is explored in more detail. I personally present a combination of some of the regular powerful stories and concepts that you have heard before and may need to revisit, and then we go deeper and have a more intense workout with some additional stories, concepts and activities you can do at the end of each module. Your self-image affects your projected image. The relationship we have with ourselves will affect every other relationship we have in our lives. It will affect how we interact in all of our relationships… as a leader, a partner and as a parent. We explore what our sparkle really is and learn strategies to keep our sparkle shiny and bright. Your energy is your attitude, your mood and your vibe. Never underestimate how your vibe attracts your tribe! Let us become so strong mentally and emotionally that we no longer let anybody steal our precious time and succumb to long bouts of ‘bad moods’ and ‘low energy’. We explore how you can ‘work out’ on all of the little challenges in life so that you are strong for the big challenges. You will not avoid challenges in life, but you can decide how you move through them. I Give and I Receive. If you don’t like what you are getting, then check what you are giving. If you want to get in the flow then give more of what you want and more will flow to you. We are more disconnected than ever before, it is time to connect with giving and embrace receiving. Learn the hidden benefits of giving and receiving. At some point some action and effort is required. There is no point in having all of the information if we are not going to do anything with it. This is your life, would you like to take a bit of responsibility with that? She asked to be successful in her business and then it started off well and then she had some setbacks… and she was devastated and cried out that this is not what she asked for, it is not fair! And the universe was so surprised, because surely if you are going to be a success you will have to learn how to deal with challenges and failure? Discover how the Universe really is conspiring in your favour. So often you also ask me, ‘How can my husband, teenagers and friends access this information and hear you speak?’ Well now they can too, right here. You purchase it once and you have life time access so you can pop in whenever you need a reminder, you need some laughter, or some soul nurturing, or perhaps some heart massaging and then some more exercises to challenge and redirect your thinking. 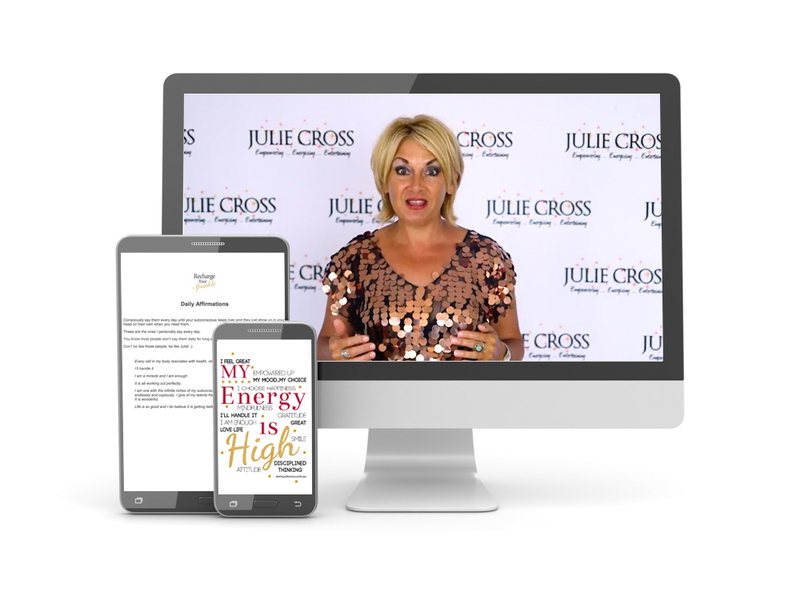 Yes, it is all here, your own personal, in home emotional fitness workout with Julie Cross. There are some little extras along the way to make the journey even more fun and add that little extra bit of sparkle. Because we can never have enough. We spend so much money dressing up the outside that we forget it is about nurturing the inside! Congratulations to you for taking personal responsibility for your emotional strength and mental fitness! Buy now for instant life-time access.